If you had seen my garden back in August when it was 105 degrees, you would have seen a garden on deaths doorstep. Even in the high heat, I reworked most of my beds and replanted a lot of veggies for my fall garden. The weather has now cooled to a chilly 95 degrees with night time lows near 70. My garden has rebounded in just one month. It should improve and grow into late November or early December. Here are some photos. This bed started the year as my garlic bed with yard long beans on the trellis, and Prudens Purple tomatoes on the rope trellis. The garlic, beans, and tomatoes did well. The other side of the trellis was my carrot bed which also did well. It now holds four varieties of heirloom tomatoes in front, "Sweet Success" cucumbers on the trellis, and Mesculin salad greens mix in front and back of the wire trellis. Mesculin mix on the back side of the cucumber trellis. It's still a little hot for it to grow, but it will when it cools a little more. How about a six foot tall Jalapeno plant loaded with tiny peppers. or a three foot tall Habenero plant loaded with small green peppers. This is my tomato cuttings bed where I am growing cuttings of all my spring heirloom tomatoes hoping for at least some tomatoes which didn't produce at all in the early spring heat. It took me a lot of attempts, but I finally learned in my summer climate, I have to provide a sunscreen or shade relief for the cuttings or they will simply wither and die in the high heat. My Armenian cucumber bed with eggplant on both ends. This bed started the spring as a mixed bed of normal cucumbers and Armenians. The normal cucumbers died early in the high summer heat and left the Armenians to prosper. Under the canopy of the Armenian trellis, you can see a lot of the dead leaves of the normal cucumbers which died back in July. You can also see the mix of the Armenian cucumbers which seem to develop depending on the heat. In the high heat, the melon shaped cucumbers grow. We had a few cool days and nights resulting in the long, slender typical Armenian cucumbers. All are growing on the same vines. I am letting the largest one grow until it is absolutely ripe to see if it will develop any kind of a melon flavor instead of a cucumber taste. My Sweet Success cucumbers are only about three weeks old, but are loaded with these tiny cucumbers which will grow to about fourteen inches in length. These fruit don't require any polination to set and every bloom sets a fruit because the variety only has female blooms. When some of the fall plants finish production, I will plant more Swiss Chard and Lettuce for a spring crop. I have seed for a few other veggies, but I haven't decided which to plant yet. Although my garden is no where near as big as Ted's, the plants in my (8' x 4') raised garden hung in there and tolerated the heat and the pests. The the heat here in central florida was the hottest I could ever remember and I moved to south florida in 1992. From a person who's paying over $700 for a monthly power bill, I honestly can't wait for the first big cold front to start the cool season down here. I am so jealous, your garden looks like ours did in late July. We are now struggling to keep just a bit of it alive for the next week. After that it's done till next year. 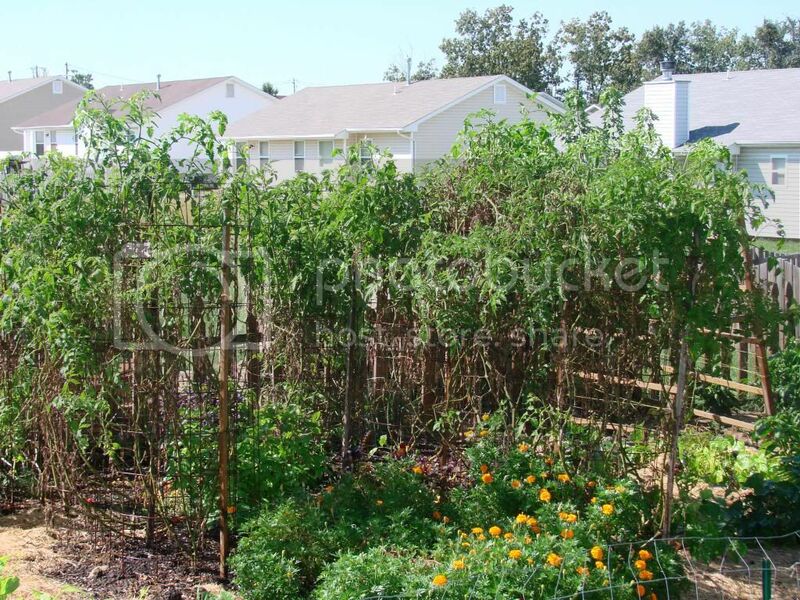 Even with a few hurdles, I'd say your garden is very successful. I don't recall, do you use low tunnels to extend the season? Last thing. When the whole population of the world moves to Texas, you should move to the the San Juan Islands. I'll keep San Juan Island, you take Orcas Island. Why live in that miserable hot weather. Hispoptart wrote: I am so jealous, your garden looks like ours did in late July. We are now struggling to keep just a bit of it alive for the next week. After that it's done till next year. I would be happy to trade my climate for your view of the mountains. No, I did use hoops to keep the svb's off my spring squash. I will also use frost blankets on the tomatoes to extend them for a couple of weeks. Take your pick. Do I get San Juan or Orca. I probably wouldn't get much gardening done though. I would be to busy salmon fishing. You can have Orcas, oh _ell, I will throw in Lopez too. Unless you want a tiny little island. Wow, Ted, your garden is growing good. Glad to hear that the weather is becoming more favorable. It looks like you get a pretty long growing season, what are your frost dates? garden5 wrote: Wow, Ted, your garden is growing good. Glad to hear that the weather is becoming more favorable. Our frost dates are approximately April 1 to Dec. 1. If we didn't have July and August on our calendars. Texas would be the garden of eden. Funny you posted this Ted. I was thinking of taking some pics of my tomatoes. They are naked to about 4 foot. But they look better now than they have in month's. At least they are 90% green now and still producing, instead of 50%+ brown and not doing a thing. Yeah here it is they are pretty sad but they are still going at least the ones that haven't been culled yet. I do have some on the other side of the yard that are doing good and volunteers still coming up everywhere. I didn't post a photo of my long tomato bed. They are just about as you described. They won't win any beauty contests. I trimmed the tops off even with the tops of the cages and they are spilling over again and don't look so nice. They are healthy and blooming though. I think I have some tomatoes in my future. Are the plants in your photo the ones you were so concerned about last spring? Ted, no those were pulled a few weeks ago. But they did alright, not great, after all the worrying I did. If I remember right you can't see the pics so mine are as said naked from about 4 foot up than spilling over. But hey who cares they are mostly green and not mostly brown for once. There is probably another 3-4 foot of green on them so they will stay until I say so. Which could be tomorrow or a month from now. Depends on how I feel. I have a few tomato plants that are reviving from our extreme summer. They have nice, new green leaves at the top and are making more flowers. I like the organization of your garden.